ZPower is providing veterans with better hearing solutions through their innovative, high performance, and rechargeable silver-zinc microbatteries. 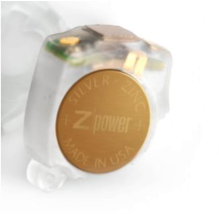 ZPower, the world’s only developer of rechargeable, silver-zinc miniature batteries, will feature its Rechargeable System for Hearing Aids at the 2016 Joint Defense Veterans Audiology Conference (JDVAC), February 22nd-24th in St. Louis, MO. ZPower will exhibit in booth #TT23 and Dr. Barry A. Freeman, VP of Business Development, will lead a JDVAC Tech Talk, ZPower: A Rechargeable Solution, February 23rd at 2pm. Silver-zinc battery technology has a fascinating history; it was first developed for the military and NASA, and early rechargeable silver-zinc batteries were used for Apollo missions. These early batteries took advantage of silver-zinc’s high energy density, but they weren’t commercially viable because of the limited number of recharges each battery could accept. ZPower has been able to solve this problem. Through nearly two decades of research, ZPower has developed a proprietary rechargeable silver-zinc battery that can be fully recharged over 400 times, and offers the highest energy density of any rechargeable microbattery. Now, ZPower is excited to bring their rechargeable silver-zinc battery technology to the hearing industry. ZPower’s Rechargeable System for Hearing Aids is an innovative product that makes it easy to convert many new and existing hearing aids to rechargeable technology. The ZPower Rechargeable System offers a full day of continuous power, charges overnight in the hearing aids, takes the place of an estimated 200 disposable batteries, and lasts a full year. The ZPower hearing aid batteries are replaced once per year by a hearing care professional so the patient never has to touch a hearing aid battery again. To learn more about the ZPower Rechargeable System for Hearing Aids visit http://www.zpowerbattery.com. ZPower is a leader in the development of rechargeable, silver-zinc batteries for microbattery applications whose headquarters and manufacturing facility is in Camarillo, Calif. The company provides a total solution for hearing instrument manufacturers which includes advanced silver-zinc battery technology and charger design support. The ZPower solution simplifies new product development and speeds time-to-market. For end users, ZPower batteries deliver unmatched performance, improved user experience and are better for the environment. ZPower is ISO 9001:2008 certified and its facility and devices registered with the FDA. For more information, visit http://www.zpowerbattery.com.